But so far the closest i´ve got to it, is a cartoonist/manga related style which i don't really dig. and i only have affinity and and very old photoshop. 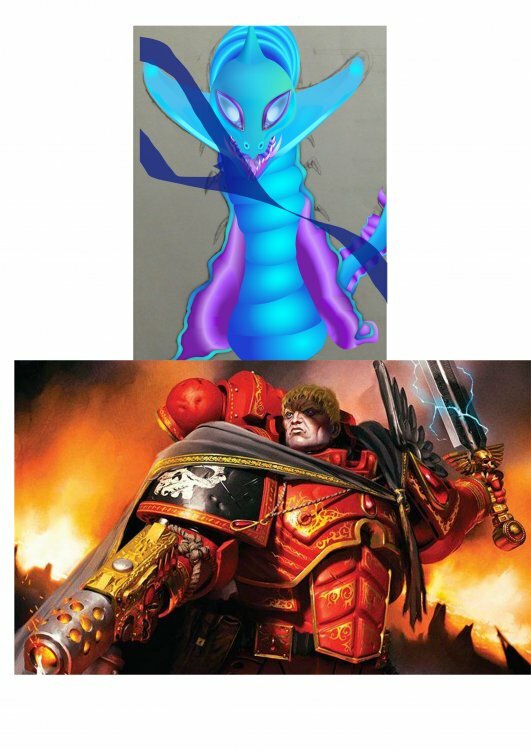 In my picture below i have illustrated what my current lv in affinity is (the blue worm, ps don't mind the watermark)... * basically just a lot of gradients and time. And the time i spend in photoshop is absurd due to corrections of lines, layers and details. and it is here affinity shine+ i would like to save that time. So does do YOU know of any tutorial or other ways i could learn to use ,to create Photorealistic picture in affinity like the blood angle?? sorry if i seems confused, but i´ve spent a lot of time reseasing this..i have no clue, as to how i can leave the toonish style behind. Besides using brush strokes, which i don't fully understand. And honestly i feel that it would be the same as working in photoshop). You might get a better response if you posted your questions in the Questions forum! You would also get a better response if your title was more specific to the problem, possibly "Help needed to create photorealisic images in Affinity Designer" (or Photo if appropriate). Sorry, but I cannot be of help on your problem. Photorealism is not my scene. Thread moved to the Question section. John Rostron Thank you alot. You might be right. I will change it so it fits the question forum. MEB Thx Meb for moving my post. * it now edited so it fits the topic better. I'm assuming by "photorealistic" you mean highly detailed, w. consistent shading. It just takes work and practice. Lots & lots. Visit the forum section "Share your work," and look over the AD examples, There are quite a few that are very realistic. Some of the better posts show the vector framework, and there are a few down loadable files that will let you examine all of the details. To blow my own horn, here's a link to something I did about 2 years ago. As I mentioned then, it took about 6 weeks. I was just learning AD, and spent between 2 & 4 hours per day on the project. Looking back, there are lots of problems. Edges too sharp, shading too flat, etc.